SHHHH...A Little Mad is a SECRET! They feature UNIQUE. Embrace WHIMSY. Celebrate HANDMADE and indulge in ONE OF A KIND. Find them inside the Bayside Landing Courtyard, 15 Cottage Street. Paws-itively a must for pet-lovers! Paw-tery, clothing, towels, flags, ornaments & figurines in breed specific designs. 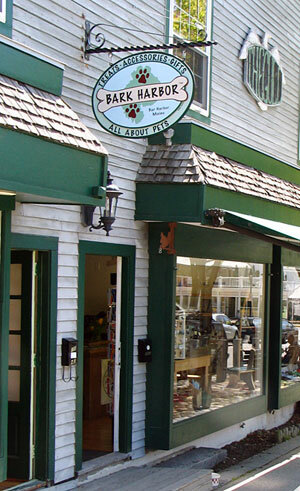 Bark Harbor specializes in American hand made items that can’t be found everywhere! The most incredible selection of designer collars & leashes. Toys shaped like lobsters, moose & whales. 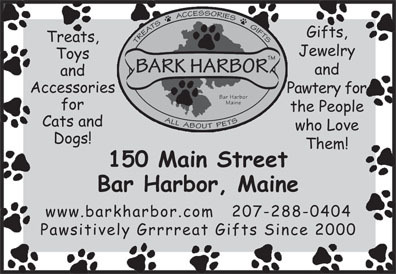 Bark Harbor will ship your purchases home or your gifts to the recipients! Help support P.A.W.S. Humane in Calais, the Ark Shelter & many other non-profit animal rescues - we give back with your help! Located at 150 Main Street, just a 1/4 block south of the Village Green. scrapbooking papers in beautiful patterns and themes; and the embellishments and notions you need to get your projects done right. The shop holds an unbelievable array of buttons, beads, ribbons, embroidery flosses, stickers, inks and stamps. 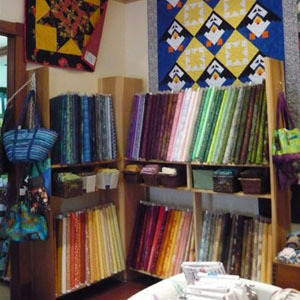 Maine themes and vintage designs find ample space, along with vivid batiks and seasonal products. Co-owners Erin Early Ward and Nessa Reifsnyder are constantly adding fun stuff into the mix, inspired by the craft magazines and books on their shelves as well as customers’ suggestions and requests. 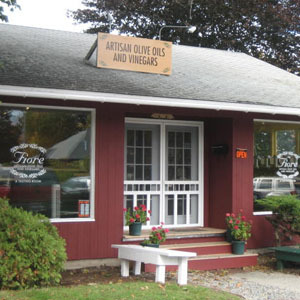 FIORE Artisan Olive Oils & Vinegars, selected as the SBA’s “Maine Woman-Owned Small Business of the Year 2013”, is a tasting room/retail shop in Bar Harbor offering freshly bottled Extra Virgin Olive Oils and Aged Balsamic Vinegars. The tasting room offers customers the opportunity to taste and have their selections bottled on-site. 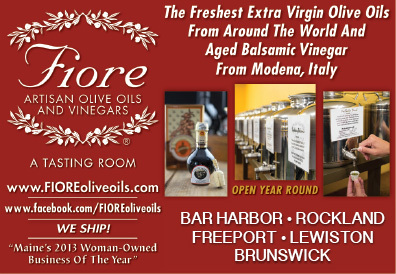 At FIORE, over 40 stainless steel tasting Fustis contain either Balsamic Vinegar or Extra Virgin Olive Oil. There are 12-year and 18-year traditional and flavored varieties of balsamic vinegars, all produced in Modena, Italy. EVOO’s at FIORE are always from the most recent harvest, including oils from Spain, Portugal, California, Italy, Tunisia, Chile, Australia & Sicily. 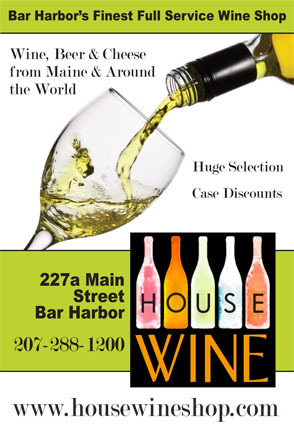 House Wine is Bar Harbor’s newest retailer of quality wine and beer. With hundreds of wines from Maine and around the world, you are sure to find what you’re looking for. 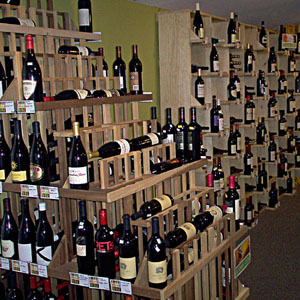 House Wine specializes in Organic, Biodynamic and Sustainable wines. They also offer a large cheese selection. Their staff is knowlegeable and offers the highest level of individualized customer service. 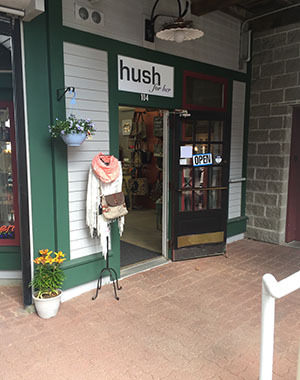 Hush is Bar Harbor’s premier boutique...for her. Featuring clothing with a cool, contemporary flair; jewelry created by small artisans including Maine seaglass and accessories, plus homewares that inspire. 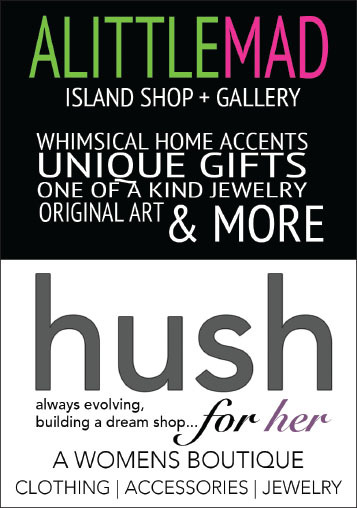 Stop by to enjoy some coastal hospitality and a laidback shopping experience at Hush...always evolving. There might not be another shop like this one — at 99 Main Street right across from the First National Bank of Bar Harbor — anywhere in Maine. Where else can you find representative works by over 300 of the finest craftsmen and artists from around the state, in one location! Founded by a group of local artists more than 30 years ago, the gallery’s fine reputation is a credit to the long-range view and artistic dedication of these very talented people. 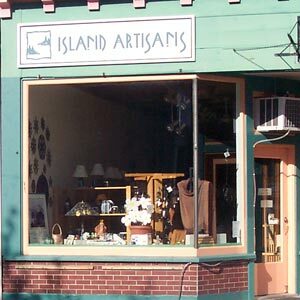 The gallery’s continually changing works of weaving, hand knitting, pottery, jewelry, embossed cards, and baskets have been consistently welcomed and appreciated by Bar Harbor visitors, and numerous locals, for over three decades. For more than 25 years, Little Village Gifts has been owned and operated by the same local family. When you walk through the door, the first thing you will find is a warm greeting. They truly care about your experience in Bar Harbor, and can often be heard giving directions or recommendations to visitors. You will find a variety of gifts in a charming atmosphere at Little Village Gifts. Downstairs will have a wide selection of Bar Harbor souvenirs, home decor, jewelry, and unique Maine and USA made items. Upstairs is for the kids. Toys, games, and stuffed animals will greet them as they ascend the stairs. Warning: Guaranteed Giggles! 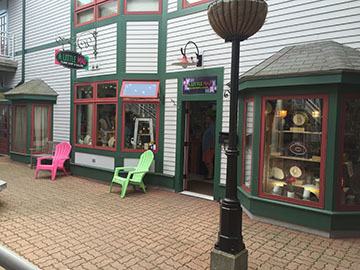 Located next door to the historic Criterion movie theater at 29 Cottage Street, Little Village Gifts will be an enjoyable place to visit while you are in Bar Harbor. 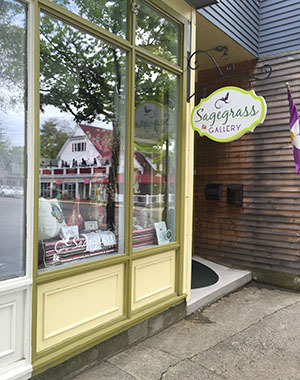 Since 2007, Sagegrass Gallery has the pleasure of sharing some of their favorite treasures from across the country and from right here along New England’s majestic coastline. 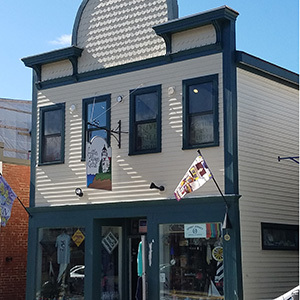 Step inside the Sagegrass Gallery to discover superb Handcrafted Jewelry, Clothing, Glasswork, Home Goods, Wearable Art, Hanging Art, Evening Bags and Unique Gifts from as far away as Israel, Turkey and Poland and as close as the Great State of Maine. In the spirit of unique and meaningful gift ideas, Sagegrass Gallery is excited to have “Caribbean Bracelets” joining them with an exclusive Mt. Desert Island Bracelet, designed for Sagegrass Gallery alone. And from our Island’s? sand, Dune Jewelry has captured the essence of the beach life including, oyster, mussel and lobster shell jewelry. Visiting the Scrimshaw Workshop (Main Street in Bar Harbor opposite the Village Green) one realizes that quality craftsmanship is the hallmark of this unique shop. The whalers’ art of scrimshaw is this shop’s specialty, but it also offers Bar Harbor’s most extensive selection of gifts and crafts by Maine artisans. Here, in an attractive gallery setting, one finds a price range to suit every pocketbook. Many scrimshaw collectors who visit the shop comment that this is the best collection of quality scrimshaw in the country. All pieces including men’s and lady’s jewelry, knives and collectable display pieces are strictly hand-engraved by owner Chris Cambridge or by other top scrimshanders from around the country. As a purist and conservationist, there are two things Chris won’t carry - imitation plastic “scrimshaw” or elephant ivory. Instead he displays the most beautiful and fascinating of scrimshaw mediums - centuries-old Fossil Walrus and even older Woolly Mammoth ivory excavated from Alaska’s deep perma-frost. 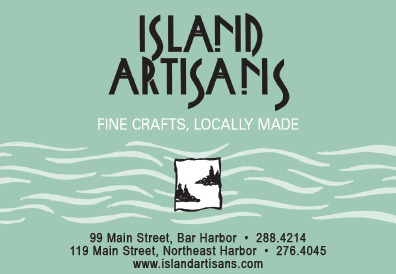 When the visitor to Bar Harbor wishes to bring home a gift hand-crafted in Maine (not China) - this is the place to buy it. The Scrimshaw Workshop carries a superb collection of hand-thrown pottery, exquisite watercolors by Maine artist Marvin Jacobs, and many gifts depicting Maine’s most celebrated subject: the lighthouse. Some of the other most popular and unique items offered by The Scrimshaw Workshop include wooden ship models, beautiful Acadia National Park photos, hand-blown glass, and last but not least, the very popular Ikebanas by Georgetown Pottery. 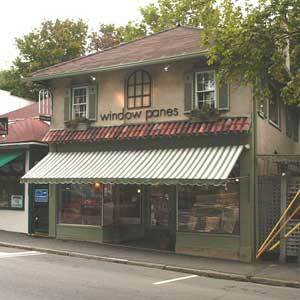 Greg and Julie Veilleux established Window Panes in March of 1994. 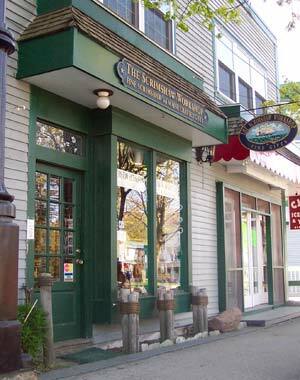 The Bar Harbor store set in a charming 1930’s Arts and Craft style building located at 166 Main Street across from the Village Green, features home and garden related products that are of distinct quality, unique, functional, and hard to find. This eclectic mix of items is all beautifully arranged creating a mood exclusively for you, the discerning buyer. Window Panes, named “one of Maine’s coolest stores” by Down East Magazine, has thoughtfully displayed all that you need for your home or summer cottage including well crafted furniture, forged lighting, artfully designed wool and cotton rugs by Co.C ®, attractive pillows, colorful and coordinated table linens, classic and cutting- edge kitchen gadgets, whimsical and functional garden accessories, and a wonderfully tempting selection of personal care items from French made soaps and lotions to robes and shower curtains. As soon as you step into Window Panes, it invites you to explore all: inside, outside, and upstairs. For more than 20 years Window Panes has provided a thriving home furnishings company on Mount Desert Island in downeast Maine and now they invite you to experience their online store at www.windowpanesmdi.com which will continue to offer the same high quality products and commitment to customer service that you have become accustomed.